THE Argentine-born artist Tomás Saraceno maintains a studio in Berlin – if you can call a disused chemicals factory a studio. There is nothing small about this operation. Saraceno, who trained as an architect in Buenos Aires, now employs hundreds of people, with specialisms ranging from art history and architecture to biology and anthropology. If you’re serious about saving the world, you need this kind of cross-disciplinary team, I suppose. Though Saraceno hasn’t exactly promised to save the world, he has been dropping some big hints. His utopian installations include Cloud Cities at Hamburger Bahnhof, Berlin, in 2011 – a collection of geometric, inflated shapes. Even by the time of his Observatory/Air-Port-City show at London’s Hayward Gallery in 2008, these shapes contained autonomous residential units. A network of habitable cells floated in the air, combining and recombining like clouds. A year later at the Metropolitan Museum in New York, gallery-goers got to explore these spaces via 16 interconnected modules made up of glass segments held in place by steel cables. And in June 2013, the K21 gallery in Düsseldorf invited visitors to wander more than 25 metres above the gallery’s piazza across a web dotted with inflated PVC spheres. Near his Berlin studio is a scruffy public park. Part of it is marked out for football. Behind one goal stands a graffitied stretch of the Berlin Wall. Today there’s another attraction: two men are running back and forth, trying to fill a black bag as big as a minivan with air. It is a fine, windless day; the air in the bag heats up quickly, and once it is sealed, the container rises into the sky. A bag no longer, it is clearly recognisable as one of Saraceno’s signature tetrahedral solar balloons. These black balloons have been plying the skies since 2007. They are mascots of the artist’s multi-stranded effort to combine engineering, architecture and the natural sciences to create a new, democratic kind of environmental art, made of bubbles and aerial platforms and webs. An art that mitigates climate change, he says, and makes the sky habitable, by establishing a modular, transnational settlement in the skies through solar balloons that require no fuel at all. An art that ushers in utopia. Could it be that this chap is just playing about with balloons? Trying to calculate Saraceno’s level of seriousness is half the fun. Over lunch, for instance, he tells me that he wants to return us “to a sort of Mayan sensitivity towards celestial mechanics”. But some of his efforts are admirably practical. The balloon I’d just seen being demonstrated was an Aerocene Explorer: it comes in a backpack complete with instructions on how to create and fly lightweight sensors. Any data collected can be uploaded and shared with Aerocene’s online community, via a website where participants from all over the world are sharing their experiments and innovations. Practicalities aside, much of Saraceno’s work is simply beautiful. For a show opening at the Palais de Tokyo in Paris on 17 October, the team is busy building playful orreries, mechanical models of the solar system that combine planetary orbits with the physics of soap bubbles and webs spun by his pet Cyrtophora citricola spiders. These unbelievably delicate confections will be on show with some mirrored umbrellas that also double as solar cookers. 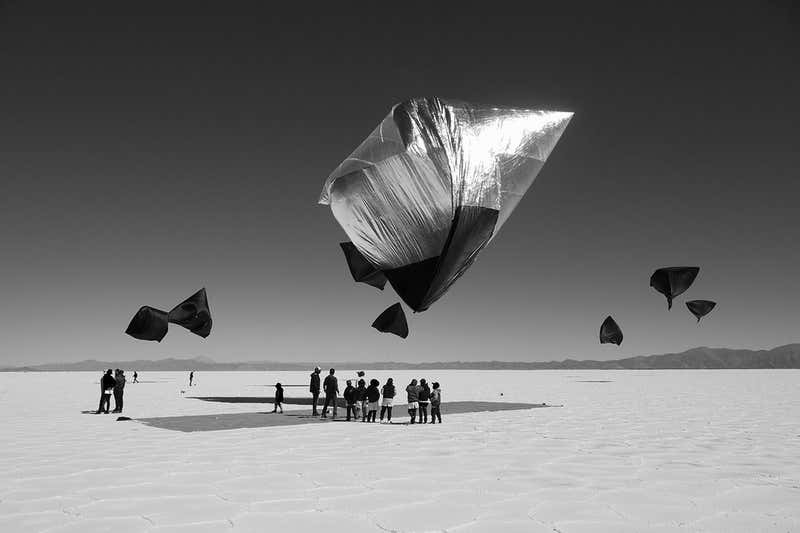 When arranged in concentric circles, Saraceno imagines that in the manner of a solar thermal power plant, the umbrellas might even concentrate enough heat to inflate a large balloon. He hopes to try out the idea when Audemars Piguet – a Swiss watch manufacturer that has recent form in backing innovative science-inflected art – takes parts of his sprawling Aerocene endeavour to Miami this December for the Art Basel fair. He found this out the moment he started using solar balloons. The balloons, which work by simply zipping up some air in a heat-absorbing bag, have been around since the 1970s. His own projects have demonstrated their usefulness in meteorology, pollution monitoring, even passenger transport. In 2015, he flew in a tethered solar balloon over the dunes of White Sands in New Mexico, where the US launched its first rockets and where the world’s first tourist spaceport is located. The Massachusetts Institute of Technology got in on the act, and created technology so that you can use the Aerocene.org website to plan a meteorologically feasible journey, by balloon, from Point A to Point B, anywhere on Earth. Here’s the paradox. Saraceno’s work has always been playful, and part of the game, he explains, has been “trying to sell this work as some sort of global solution to something”. But while his visions of an airborne utopia remain as remote as ever, his Aerocene project has spawned a foundation that uses lightweight balloons for climate activism and pollution monitoring. And even the absurd spectacle of someone jetting from country to country to fly fuel-less balloons has become part of the art, as Saraceno’s studio begins to record his own carbon footprint. Saraceno makes an important point about how we address climate change in our lives. The trick, he says, is not to let the perfect get in the way of the good. Escapism is fine. He has no time for the way so many artists and pundits are ringing humanity’s death knell. He has a special contempt for the lazy way the word Anthropocene crops up now in every climate conversation, as if, with the advent of this putative new era, our doom was sealed. “What a great way for a small number of people to disempower and demotivate us,” he says. Given the seriousness of our environmental bind, isn’t escapism a bit irresponsible? Saraceno points me to a 1957 paper by psychobiologist Curt Richter. His gruesome experiments left rats to drown in water-filled containers from which they could not escape. But if he briefly rescued rats at the point they gave up swimming, and then returned them to the water, those rats continued to fight for life 240 times longer. Richter concluded that they had learned that there was hope. Faced with challenges on a planetary scale, we are scrambling for our lives, and can see no way out. “We need the energy those rats got when they saw some small hope,” says Saraceno. I hadn’t expected our conversation to take this dark turn, but creating such small glimmers of hope is his business. If he is a joker, then he is one in the best sense of the word. Should we take Saraceno’s work seriously? I was doubtful, but now I think, why look a gift horse in the mouth? He enthuses people. He gets us thinking. And he is right: a little hope goes a long way.